Arab Emirates and Dubai Travel Photography Gallery : photos, photographs, pictures and images of the United Arab Emirates and Dubai. For travel information on Dubai hotels, tours and flights see the Dubai and Arab Emirates Travel Guide. 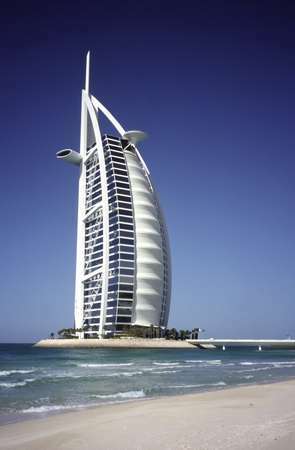 Photo of United Arab Emirates, Dubai, Jumeirah Beach Resort, the "7 star" Burj Al Arab hotel has become a landmark of Dubai. This unique sail-shaped building stands on a man-made island some 280 metres offshore. It is an imposing 321 meters high.